Tucked just behind the Blind Tiger you could be forgiven for walking straight past this place into the wood store next door; this is Mexican street food quite literally brought to the back streets of Brighton. The street vibe is evident; with only a small outdoor seating area most customers take off munching theirs on foot. If you can’t get there, these guys will deliver your food by skateboard or BMX to the Lanes and surrounding streets. We’ll stop using the word ‘street’ now. The menu has only two things on it. If you’re hungry, go for a burrito; with a choice of veg, chicken, beef or prawn, prices vary, but start at a too-good-to-be-true £4 up to a still cheap £5.50. All come packed with a myriad of Mexican additions including rice, veg, salsa, sour cream and cheese. We go for chicken, which is chopped into tender bite size chunks. The peppers and onions are sweet and soft and compliment the zing of the salsa nicely. The chilli sauce certainly has a kick to it but is combated by the sour cream. You might expect to fall into a carb-induced coma after the combination of rice and tortilla but it makes it a nice compact wrap to eat on the go. 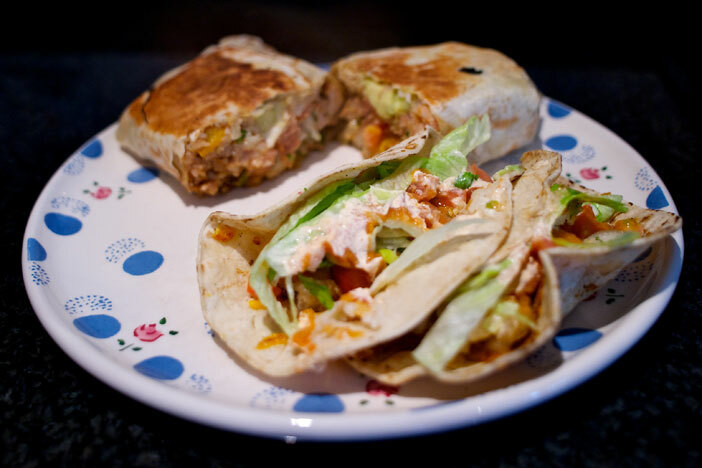 If you fancy a snack, go for the quesadillas (£3-£4 for two), which are like mini versions of their burrito brothers. With a choice of cheese, chicken or beef they are small but mighty and packed with flavour. Both the burrito and quesadillas were surprisingly fresh and healthy tasting. The menu is limited, but that is not always a bad thing. You know a food establishment is confident in their offerings when they don’t feel the need to fill up a menu with neither-here-nor-there dishes. What Carlito-Burrito does, they do very well. We were probably more inquisitive than their average customer on a rainy Wednesday afternoon but the guys were friendly and enthusiastic. We think they just thought we were chatty.